Vastex announced a new VRS Pin Registration Station for rear and side-clamp screen printing presses. It features a new mobile base with flat files and storage shelf as standard, allowing film positives to be registered off-press with increased efficiency and in less floor space. “The addition of four drawers and a lower shelf keeps tape, T-squares, film positives, emulsion containers and other supplies readily at hand, eliminating the need to leave the station for supplies or take-up space with side tables or utility carts,” says Mark Vasilantone, president of Vastex. “The new mobile base also allows the entire station to be rolled away when not in use” he adds. The VRS system allows an operator to align all film positives in registration on the pin board, and maintain that registration when transferring positives onto each printing screen held in position against plastic round screen stops. Once screens are exposed, the pallet jig is secured to one pallet of the press, allowing each screen to be held against stops before being secured to the rear or side clamp of each respective print head, maintaining screen-to-screen registration. In addition to cutting registration time by 70 to 90 percent, the system improves registration accuracy while reducing rejects and creating a shop registration standard. The system includes a pin board used to align artwork onto screens; 24 pre-punched set-up sheets to transfer each positive from the pin-board to a screen; a pallet jig to align each screen to the press, and the mobile base with drawers. 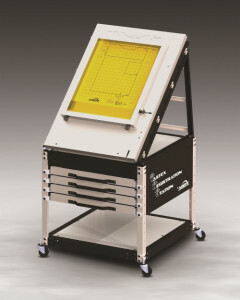 The pin board measures 53 x 66 cm and has outlines for positioning of standard and oversized shirts and chest pockets, and 2.5 cm grids of 31 and 46 cm square indicating the “sweet spot” for artwork. The pin board mount allows variable angle as well as height, which can be adjusted as low as needed for a user in a wheel chair. All components are constructed of heavy-gauge steel with rust-resistant finish. The VRS system accommodates wood, aluminium or retensionable screens up to 58 cm W x 79 cm L, pallets 35 to 53 cm wide, and fits rear or side-clamp presses of most makes and models. Additional VRS Stations are available for side clamp manual presses and automatic presses, as well as a “VRS Lite” combination pin board/pallet jig version that is ideal for small shops looking to save space.